MathewLane, prestigious and widely (get the pun!) 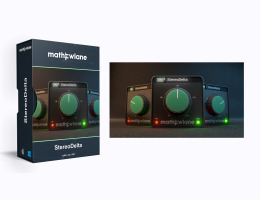 acclaimed developers of mid-side stereo enhancer DrMS have today released their long-awaited follow-up plug-in called “StereoDelta”. StereoDelta is an easy to use spatial processor, available as AAX/AU/VST/VST3 plug-in, with one powerful knob to control your stereo image. From true mono to three dimensional width, StereoDelta always maintains a natural sound thanks to DrMS technology inside. Some might find the power of critically acclaimed DrMS a bit overwhelming, this is where StereoDelta comes in: One knob controls several parameters of the advanced DrMS algorithm inside at once. Well chosen internal parameter combinations make StereoDelta a flexible and creative tool for instant high quality useful and unique results. StereoDelta’s single control knob goes from true mono fold down (save all stereo info into mono!) at the left of its range, over your original stereo at 12 o’clock, into 3D expanded stereo to the right. StereoDelta’s DrMS style widening does not only make your soundstage wider, but also deeper, more open, more real. And always with the confidence of mono compatibility. Using either Host Computer authorization or iLok2 (or higher) USB dongle for easy authorization, it's your choice! In order to use the software an iLok user account is required. Authorization is supported on both Host Computer and iLok gen 2 or above. Get the 14 day demo!